Attend an HBCU? Interested in an Internship at Coca-Cola UNITED? 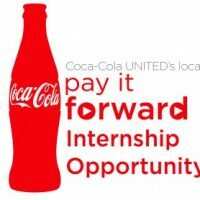 Coca-Cola UNITED’s ‘Pay It Forward’ Internship Contest applications are now available to those interested in applying for 2018. Those selected for the prestigious program will be given the opportunity to participate in a week-long internship at a Coca-Cola UNITED facility. 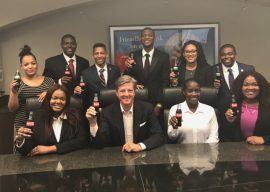 The program offers students firsthand experience in a range of roles available at Coca-Cola, including operations management, packaging, pricing, event planning and philanthropy. The contest is open to those age 18 years or older at time of entry, and they must be enrolled as a full-time undergraduate college student at a participating Historically Black College and University (HBCU). For the past two years, 10 students representing five local Historically Black Colleges and Universities (HBCU) in Alabama were chosen to participate. The company expanded the program for 2018 to include schools throughout the seven-state footprint where Coca-Cola UNITED operates. The internship experience is a part of the companywide “Pay It Forward” program, which aims to provide African-American youth with opportunities to celebrate students’ achievements and further their success. For more information on the annual “Pay It Forward” student opportunity, visit https://cocacolaunited.com/coca-cola-united-pay-it-forward-internship-application/. Coca-Cola Bottling Company UNITED, Inc., founded in 1902 and headquartered in Birmingham, Alabama, is the second largest privately held Coca-Cola bottler in North America and the third largest bottler of Coca-Cola products in the U.S. Among the franchises operated by UNITED include Chattanooga, the world’s first Coca-Cola bottler, and Atlanta, headquarters of the worldwide Coca-Cola System. UNITED has approximately 10,000 associates located in 54 sales and distribution territories, and nine production facilities, across seven southeastern states.